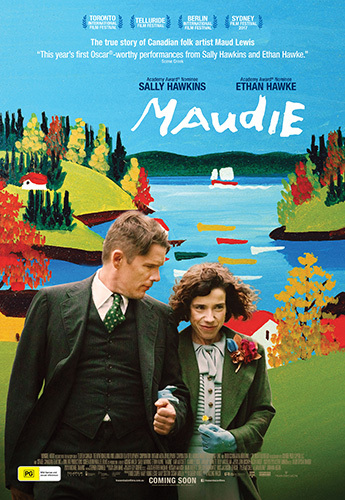 Based on the true story of Canadian folk artist Maud Lewis, 'Maudie' is an unlikely romance in which the reclusive Everett Lewis (Ethan Hawke) hires a fragile yet determined woman named Maudie (Sally Hawkins) to be his housekeeper. Maudie, bright-eyed but hunched with crippled hands, yearns to be independent, to live away from her protective family. She also yearns, passionately, to create art. Unexpectedly, Everett finds himself falling in love. 'Maudie' charts Everett’s efforts to protect himself from being hurt, Maudie’s deep and abiding love for this difficult man and her surprising rise to fame. Click here to read our theatrical review of 'Maudie'. The 'Maudie' competition has now closed. Winners will be announced shortly. Competition opens at 5pm AEST on Sunday 13th August 2017 and closes at 11:59pm AEST on Sunday 20th August 2017. Five winners will be chosen at random on Monday 21st August 2017. To successfully win, entrants must fulfil the above entry conditions before the time the competition closes. Current members/followers are eligible to enter the competition. Only one entry per person. Only one winner per household. To be a valid winner, the entrant must not have won a prize from SWITCH within the last 28 days. Each winner will receive one double pass to 'Maudie'. By entering, you agree to receive occasional emails from SWITCH in the future. If you decide to unsubscribe from these updates, any further entries will not be applicable. Only Australian residents are eligible to enter. 'Maudie' is in cinemas from Thursday the 24th August 2017 through Transmission.